The bass solo from Stravinsky's Pulcinella Suite has been edited by Lawrence Hurst, former principal bassist with the Dallas Symphony Orchestra and Professor and chair of the String Department at Indiana University School of Music since 1986. Hurst's bowings, fingerings and other editorial markings have been added throughout the score. The Pulcinella Suite consists of music from the ballet Pulcinella by Igor Stravinsky based on an 18th-century play and character originating from Commedia dell'arte. The story of Pulcinella is taken from a manuscript from Naples, dating from 1700, containing a number of comedies portraying the traditional character of the popular Neapolitan stage. The ballet unfolds in one single act. Pulcinella was an important turning point in Stravinsky's career, as it led him to his second phase as a composer: the neoclassical. Unlike his earlier ballets, which were characterized by huge orchestras, and innovative rhythms, Pulcinella is relatively simple and sparse, scored for 33 chamber players and 3 vocal soloists, and sticking mostly to time signatures that had been used two centuries earlier. 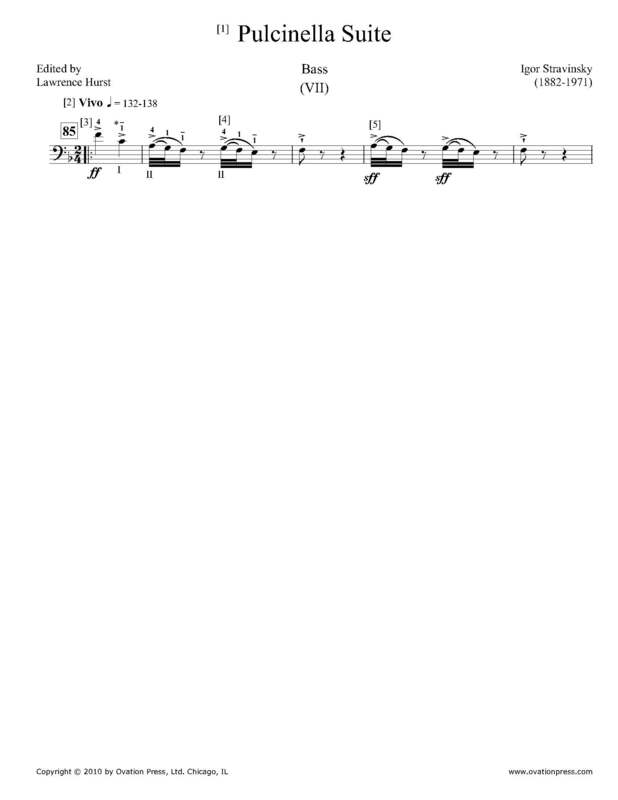 Download and print the score today to gain access to expertly edited Stravinsky's Pulcinella Suite bass fingerings and bowings from Lawrence Hurst! Please note: There is one page of music encompassing the bass solo from the Pulcinella Suite and one page of commentary and instruction. This score is only available for purchase by customers living in the USA. In 1920, the famous head of the Ballets Russes, Dyagilev, invited Stravinsky to arrange a ballet score on material from the 18th century master, Pergolesi. The result was a suite for chamber orchestra, drawn from Pergolesi models.